Let’s face it, the day-to-day operations of NGOs or charities isn’t an easy task. And, to add to more workload, you regularly need to promote your organization, as well as its mission. What does your NGO need in order to promote its cause and also to receive generous donations? Email templates, which is considered as a powerful weapon in the marketing battlefield is an effective feature of email marketing software. It is far more effective than traditional promotional means like newspaper ads and flyers. Email templates can be transmitted through an automated mechanism. Hence no extra workload. It is cost-effective, which is helpful in saving your funds. 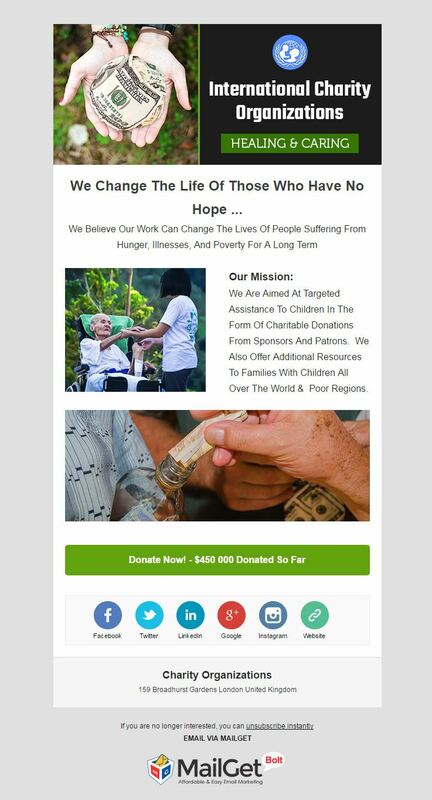 -> Boost up your charity’s reach with the help of 8+ Best Charity Email Marketing Services For NGOs, & Non-Profit Agencies. This email template has been created with the help of drag & drop builder, under the guidance of high marketing personnel. Since the template design contains all the necessary elements, you are bound to deliver your message effectively and with easy tracking of open and click rates, you can further improve your campaign’s content. 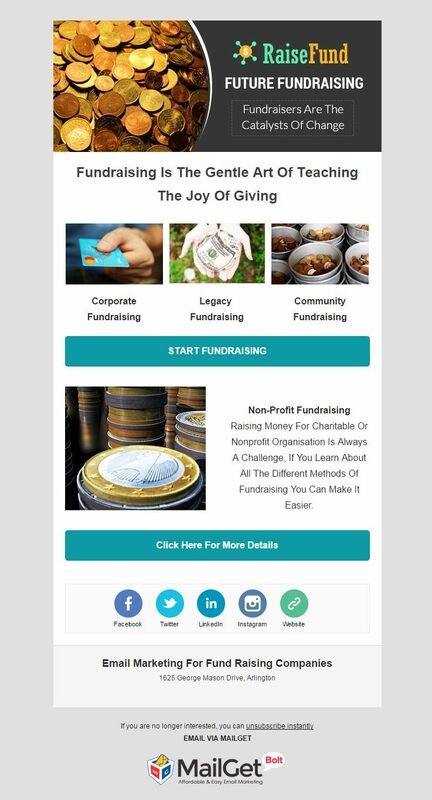 With the proper use of email template, designed specifically for organizations who focuses on raising money for good causes, you can achieve maximum exposure for your establishment. The auto-responding email functionality will reduce your work because of its automated mechanism. So, you can effortlessly address and thank your donors without any extra effort. 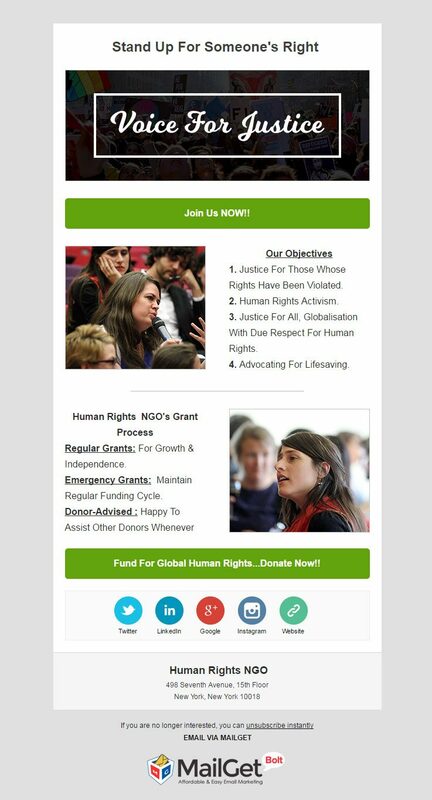 The visually attractive email template for child’s right NGOs acts as a trump card when raising awareness about highly concerning issues. The drip emailing feature, when used with this template, helps you to get in touch with your client at regular intervals and also at the optimum time. This constant communication helps you to strengthen your support force. The email template is packed with a lot of powerful features, one of which is 99% delivery rate. With this amount of successful delivery rate, you can reach your potential client’s inbox and notify them about the upcoming women rights awareness camp. Even if your recipients ignores your emails at the first time, you can get back to them with the auto follow up emails. 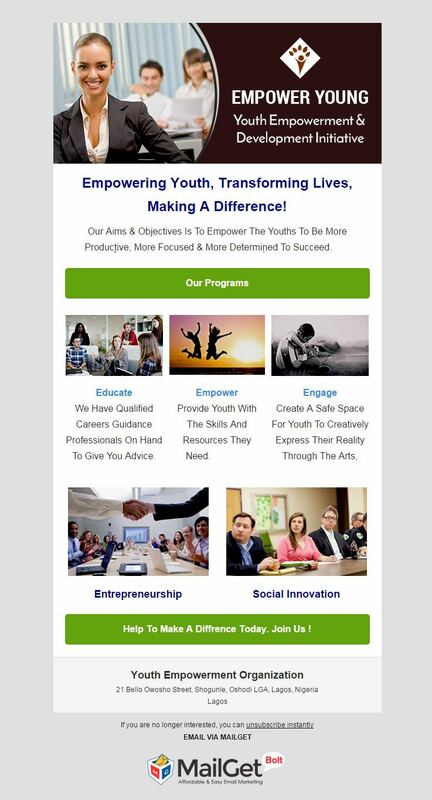 Through this email template, you can accomplish the desired support base and donations because of it’s tempting design and shareability options. Social media shareability option is one of available option which ensures you and your subscribers to spread the message/mission across every available platform. 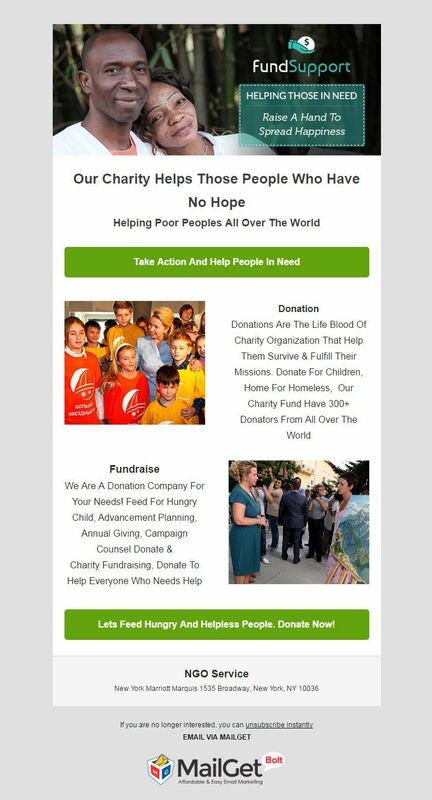 The cheap and highly effective email template for charity funds is useful in raising money and your reputation in the nonprofits circle. The subscriber segmentation feature and this template is an extremely productive combo. This way you can target your diverse audience according to their interest areas. The only reason behind the template being highly customizable is Drag & Drop editor. You get to drag and drop various fields into the template area with ease and also, you get to embed a subscription form in the layout if deemed necessary. This way you are providing a medium for your clients to support your NGO and an opportunity for youngsters to join your organization to avail benefits. 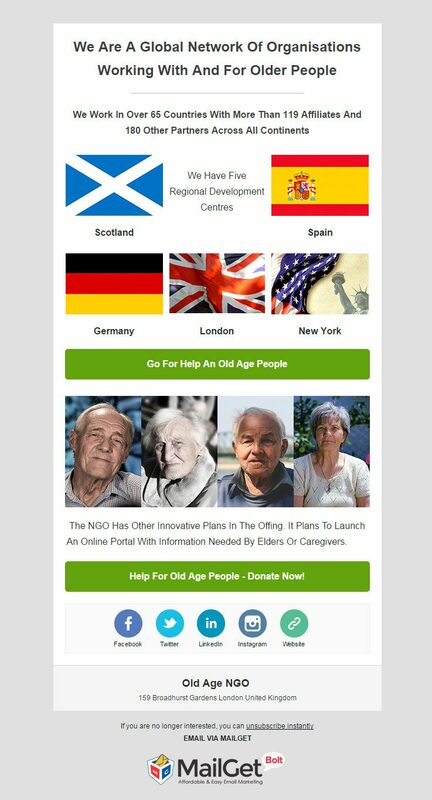 Prepare to be stunned by our latest email template for old age homes and elderly care centers. With the assured 99% inbox delivery rate, you can effectively promote your elderly care services. The list management attribute enables you to easily take care of your leads and ultimately focussing on taking good care of seniors. 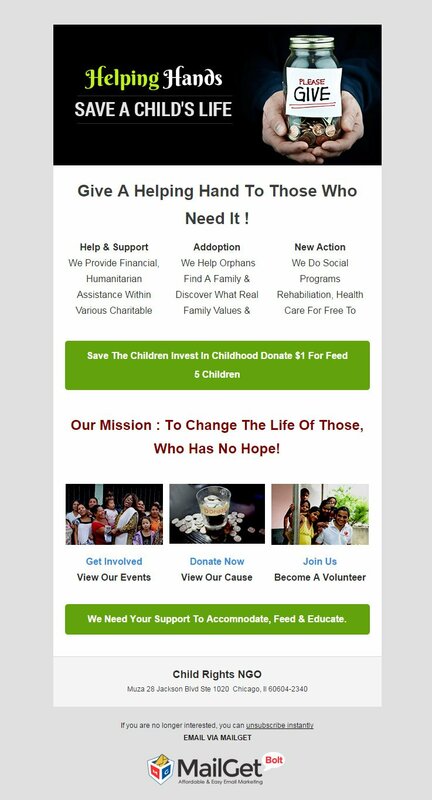 All the promotional activities for your charity and NGO can be taken care of, in a cost-effective manner with the help of email templates. The automatic emailing mechanism such as drip emails & email scheduler can be used to regularly interact with your supporters and also to send weekly progress newsletter. Auto responding emails can be used to thank donors as well. 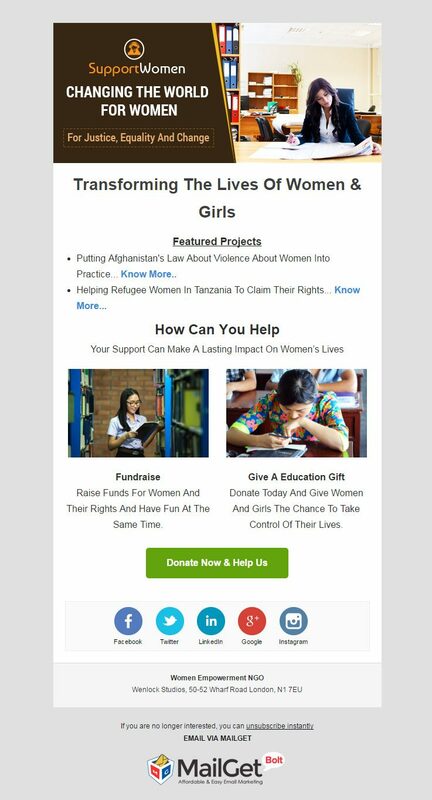 All the above-listed best charity email templates have been designed by Drag & Drop builder, but you can still design your own personalized template using MailGet Bolt. 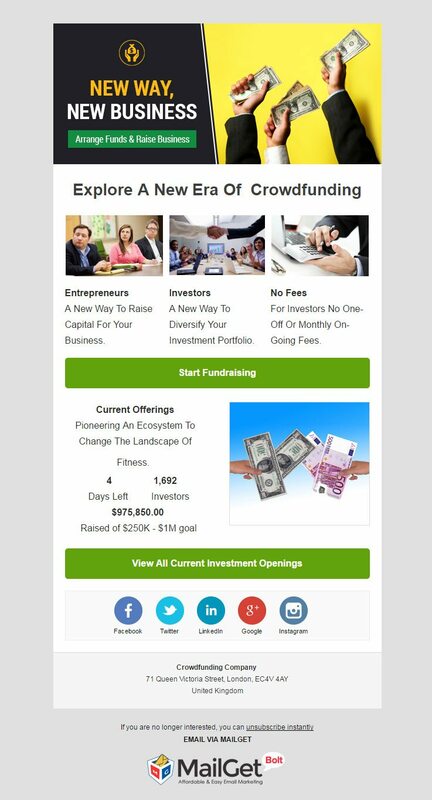 By now you are well aware of how email marketing would help in the charity business.